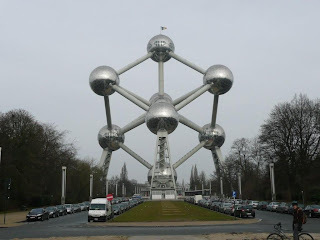 Brussels – Do your dream! En-route South we have stopped in Brussels for a couple of nights and had a cycle tour of the city yesterday. The picture is supposed to be a representation of an atom – any guess for the element? Off now aiming to make Strasburg for the night. So far so good – and as yet we’ve not finished off the first pack of biscuits!